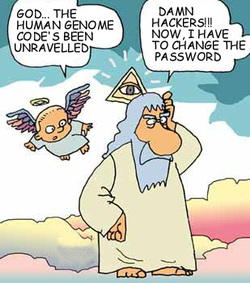 Source: Human Genome Cartoon. boydfuturist, 2011. While the Catholic Church didn't make a formal statement about the HGP, the late Pope John Paul ll briefly commented that genetic medicine is acceptable to treat disease, but not to alter genes to create an ideal human being. Source: "The Catholic Moral Tradition and The Genome Project and Diversity Project." Life issues, 2002. Overall, scientists were enthusiastic about advancing science through the HGP. 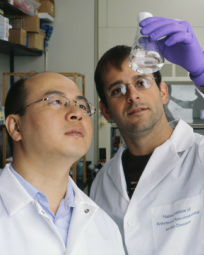 It gave them a chance to collaborate with other scientists worldwide as part of this unprecedented endeavor. But some scientists did not see the future value of this science and were concerned about how the cost of the project would impact their research. Into Native Cartilage. NIH, June 25, 2007. "Mapping the human genome has been compared with putting a man on the moon, but I believe it is more than that. This is the outstanding achievement not only of our lifetime, but in terms of human history. A few months ago I compared the project to the invention of the wheel. On reflection, it is more than that. I can well imagine technology making the wheel obsolete. But this code is the essence of mankind, and as long as humans exists, this code is going to be important and will be used."